Thank you for taking the time to complete this survey. This survey will help us to better understand the challenges we face in America today and, more importantly, how we may overcome these challenges to achieve our mission of returning political and economic power to the American people. Please do your best to answer all five questions as honestly and accurately as you can. 1.) When you think about political and economic tyranny in American today, how much do you agree that the fault lies with the leadership of one of the two political parties in Washington (either Democratic leaders or Republican leaders—but not both)? 2.) When you think about political and economic tyranny in American today, how much do you agree that the fault lies with the base of the “other” political party in general, including the regular, everyday members of that other party? 3.) How much do you agree that the political divisions between Democrats and Republicans are already too entrenched to consider coming together in order to take the reins of power away from the professional politicians and ruling elites, so that we may return political and economic power to the American people? 4.) When you think about political and economic tyranny in American today, how much do you agree that the American people must put aside partisan divisions in order to return political and economic power to the American people? 5.) Where do you see yourself on the political spectrum? *New: 1.) What do you think are the three most important political and/or economic issues facing America today? Eliminating Corporate Welfare, Including Tax Breaks, Subsidies & Loopholes. *New: 2.) How critical do you believe the above issues are to the near future of America? If not resolved, it could mean another Great Depression, economic collapse, riots, lawlessness, high unemployment and homelessness. If not resolved, the status quo will continue and things will basically remain the same, not get any worse. If not resolved, things will slowly begin to improve as corporations and elites gain further and further control and we live in a peaceful and efficient Corporatocracy. If you have ideas about how to improve or expand this survey, please leave your comments below. 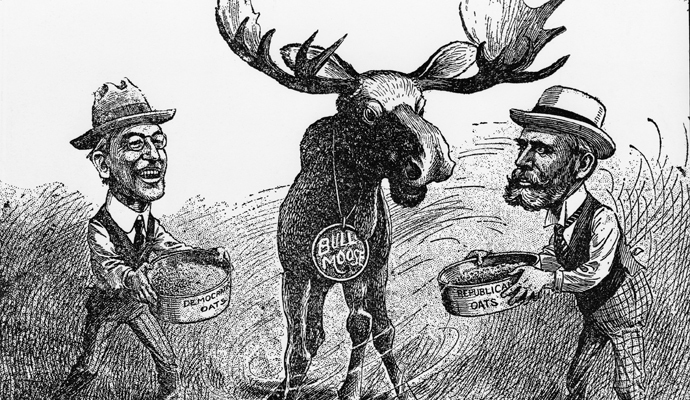 I’m 1000,000% for the Bull Moose Party!